From Cape Town, take the N1 towards Century City. Turn off to the left onto the N7. 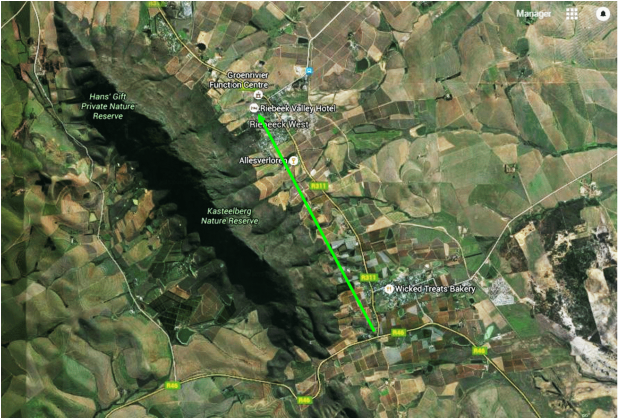 Follow the N7 for about 70-km till you reach Malmesbury. Take first Malmesbury/Darling turn off to your left (R 46) and keep left. Turn left at the yield sign and carry on under the bridge. Go straight over the first traffic lights, past the Bokomo Silo’s on the right. At the second set of traffic lights, turn left. Turn first right – the sign says “R 45 – Riebeek Kasteel, Ceres, etc. At the top of this road is another sign to Riebeek Kasteel. Turn right here, following the sign, and the R 45. Carry on straight for 4 km’s. Turn left – following the Riebeek Kasteel sign and R 46. Carry on straight for about 15 km’s. You will go over the Bothmanskloof Pass. (Down the Pass is a white wall on your left; Kloovenburg Cellars; excellent wines and olive tasting). Just past Kloovenburg, turn left onto the R311, past Riebeek Kasteel. Carry on straight for another 5 km till you reach the town of Riebeek-West. Near the end of the town is a Riebeek Valley Hotel notice board indicating a turn to your left. Turn left here into Lang Street. Carry on up Lang Street and right into Dennehof Street. The venue is on the left. The reception is in at the second gate.